The 12V 7Ahr “alarm” battery is still a safe, dependable choice for stationary back-up supplies, running items such as LED lighting or modem/routers. 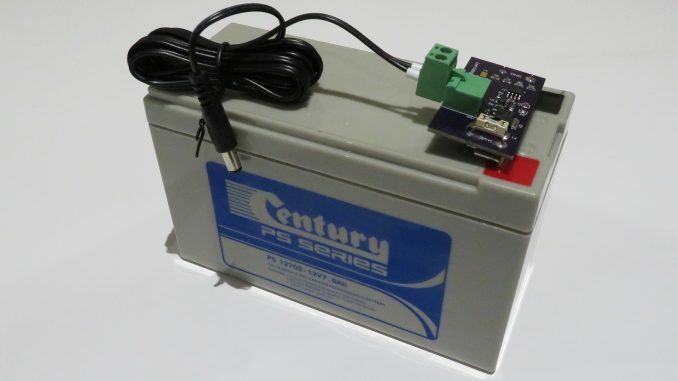 Using two Keystone 3571 female PCB terminals, this PCB assembly attaches directly to the terminals of a 12V 7AH SLA Battery (with 4.75mm spade terminals) and provides a low voltage cut-out to protect the battery, and a fuse to protect wiring. The Maxim Integrated MAX8212 Micro-power Voltage Comparator with 1.15V reference switches a high side P-Channel MOSFET to disconnect the load. The MOSFET has a low on resistance of 4.1mOhms and a maximum current capability of 90 Amps well exceeding that of the battery. The MAX8212 can operate with a programmable threshold and hysteresis (Populate R3/R6/R7) ensuring the load doesn’t oscillate when the low voltage trip point is reached and the battery terminal voltage rises. However, if this behaviour is not desirable, this circuit also allows the low voltage event to be latched by populating R4/S1/R7 instead, as per Maxim Application Note 926. When the load is switched off, the MAX8212’s 5uA quiescent current and the 11.2uA load of the voltage divider ensures the battery is not discharged. The 102k/953k/86.6k voltage divider sets a low voltage cut-out at 11.9V and a reset high threshold of 12.87V. Three printed circuit boards fabricated by OSH Park costs $11.15 and the BOM cost is approximately $12.15 from Digi-key.